15 minutes after 12 o'clock market stalls are removed and space cleaned, all the stores are closed and piazza is starting to receive new kind of visitors. Still functional cafe Pedrocchi nearby, opened in 1826, and numerous others are filling with people on the lunch break. Both this and a previous Piazza are together with, just steps away, Piazza dei Signori forming very popular public gathering area of Padova. We have our lunch in caffe Soffioni, one on the right, and really enjoyed our stay on this extraordinary square. Go back to Piazza Della Frutta and sense what difference 15 minutes makes. Another very interesting sight was observed. Notice the engagement of graffiti artist in art creation of the protective fence around never ending restoration works on the palazzo. Isn't it better than to fight constantly with alternative urban art movement? 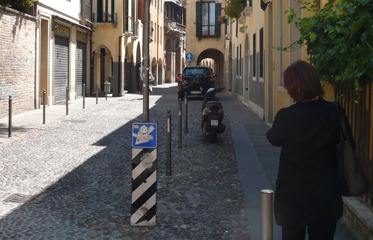 City officials are restricting size of the vehicles entering the center, protecting pedestrians from motorized traffic and still keeping intact the way street looked in medieval times [see photo bellow right], simple and smart!